A found a gorgeous day near the end of September to make this drive. 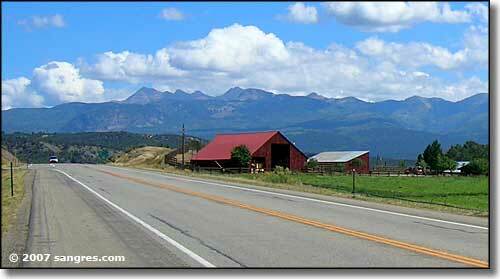 Durango to Cortez is about 45 miles. There's a long steady upslope to get out of Durango but then the road is in open country with a few ups and downs, but nothing bad at all. Lot of traffic, this is the main road to Mesa Verde National Park. It's been so many years since I've been on this road I'd forgotten what everything looked like, except that first mesa where you enter into Mesa Verde. For some reason, that has always stuck with me since the first time the family took me in there back in the mid-1960's. That and the Durango-Silverton train ride, which I need to do again. Anyway, this is lush ranch country. I can see why the Anglo invaders had the government push the Utes out of here, even if my sympathies are with the Utes on this one. Historically, there were American cattle ranchers moving into this country almost immediately after the feds gave it to the tribe. It only took a few more years for the Anglos to engineer situations that required the further "removal" of the Utes. 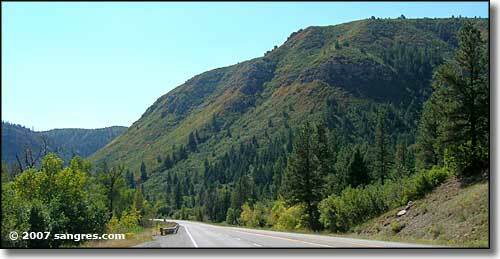 Hesperus is the first town you come to out of Durango but it's off to the south of the road and well hidden in the tree cover. 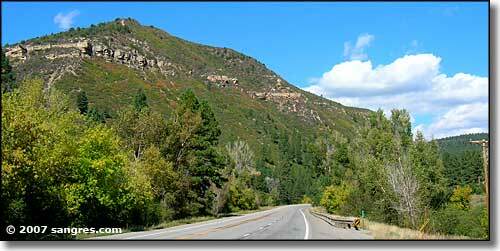 Then you pass the old Hesperus ski slope and head back down into Mancos. Just east of Mancos I came to an elk ranch. I might not have noticed it but for all the cars stopped beside the road and the men in orange standing there drooling. Just off the road to the south was a high fence, with several bull elk, some with big racks, just the other side, standing in the pasture, browsing for lunch, ignoring all the people. As Mancos is mostly off the road, I did turn in and take a drive through. With all the focus on Mesa Verde National Park (just 5 miles up the road), I never realized that Mancos is a nice little town with history of its own. When Mancos was founded back in 1894, it was a regular train stop for the ranchers to send timber, beef and vegetables to the miners up north. Cortez, which is much bigger than Mancos now, was hardly a bend in the wagon road then. Once past Mesa Verde, it's a straight shot into Cortez across a scrub-littered, semi-arid plain. I took some photos of the Mesa Verde escarpment to the southwest and of Sleeping Ute Mountain as I approached Cortez. There wasn't much else out here.